STRONG SUCTION CUP for temporary hands-free usage. While they are not designed to be permanent fixtures in the bathroom, the suction provides convenience in times when you want your hands to be free, like when bathing. CARRY-ON APPROVED: Refillable, reusable travel size bottles and clear toiletry bag packaging are TSA approved and safe for carry-on/traveling through airplane. Each set includes a portable and transparent travel accessories organizer case. 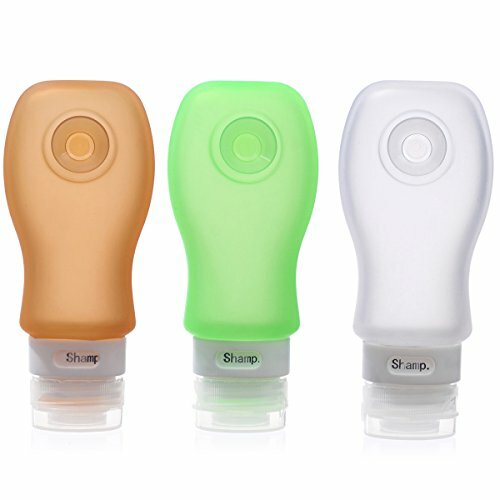 LEAK-PROOF DESIGN: Drip free dispenser releases bottle contents only when the soft, flexible, squeezable silicon travel tube body is pressed. Each lid has 3 leakproof walls to prevent leaks or spills. They are the best storage solution for toiletries, made especially for every smart traveler. MADE OF QUALITY MATERIALS that will last a lifetime of travel and adventure. Its strong, sturdy design makes it a better alternative to disposable plastic containers that simply don\'t last. Our travel bottles are made of FDA approved and 100% BPA free food grade silicone, making it safe for other liquids like sauce, salad dressing or even baby food.